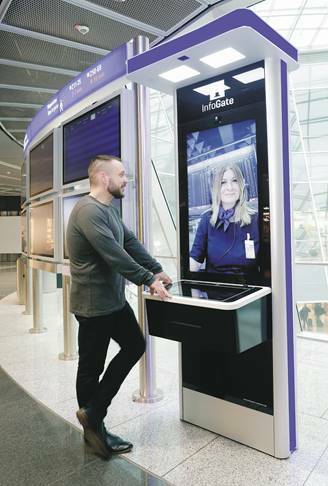 Frankfurt Airport’s newly introduced Infogate service provides passenger information with a unique twist. Questions are answered directly via video call. After pushing a button, an airport employee who is ready and willing to help appears promptly on the full-sized screen. The service team speaks up to 20 different languages, from German and English to Luo (spoken in parts of East Africa), supplementing their face-to-face assistance with inviting gestures and direct eye contact. The Infogates also display maps and other information that passengers can then print out to take with them. The Infogates are located in Terminal 1 in Pier B (non-Schengen), the CD passageway and Pier Z, and in Terminal 2 in the transit zone. They can be used daily between 6 a.m. and 10 p.m.
With its slogan “Gute Reise! We make it happen,” Frankfurt Airport’s operator Fraport is systematically focusing on passengers and their individual needs. Fraport is also taking its slogan as the inspiration to develop new services and measures aimed at continuously improving the travel experience and customer friendliness at Germany’s largest aviation gateway. Passengers and visitors can find more information about the wide range of services at Frankfurt Airport on the airport website, at the Service Shop, and via Frankfurt Airport’s social media channels on Facebook, Instagram, Twitter, and YouTube. Passengers, employees and visitors of the Muslim faith now have another place to pray and worship at Frankfurt Airport. Today (February 1), a new Muslim prayer room has opened in the public area of Terminal 2. The multi-functional space has a foyer with a storage facility for shoes and coats. The prayer room itself is at the rear and constitutes a quiet area for Muslim prayer. A curtain divides the space in two so that men and women can pray separately. In the entrance area, separate washrooms for men and women are available for ritual washing.